The earliest Western conception of creativity was the Biblical story of creation given in Genesis, from which followed the idea of the artisan doing God’s work on earth…. They confirmed their creative powers through… sharing qualities with God…. Christianity, by turning our eyes to the future, played a leading role in the discovery of our power to create. Truly, our creative ability is a gift of God. It is the goal of this essay to explore the subject in relation to Christian ministry and leadership. Creativity is not the same as EXPERTISE. Expertise might actually cause a person to stop thinking outside the box. Once someone approaches mastery in their field (10,000+ hours of intentional practice), their creativity can actually begin to decline. Creativity is not the same as being ARTISTIC. Some classical pianists can perfectly reproduce Beethoven or Bach, but they cannot create their own compositions. Cover bands can mimic the melodies of The Beatles or Elvis, but cannot create their own hit songs. Creativity is not merely having a WILD IMAGINATION. Imagination and creativity are related, but the two are not the same. Creativity is a blending of divergent and convergent thinking. Convergent thinking reproduces known concepts and applies them to new situations. Divergent thinking involves incorporating new ideas to new situations. As we will see, to be creative, we need both convergent and divergent thinking. The two are complementary—not contradictory. Creativity often cures fatalism or frustration. Uncreative leaders try the same methods over and over, but without any results. Over time, they can begin to believe that there is something wrong with their people, because nothing ever changes. By contrast, creative leaders enjoy working through stall outs and problems with their people. It’s in these settings that their creativity comes alive. Creative leaders utilize their limited resources better. This might be why leaders can have such a profound effect on the success or failure of a group. Instead of asking God for more resources or better people, creative leaders seek to better steward the resources they already have and employ them more effectively. Is creativity a quality that we’re born with? Or is it something that can be learned, developed, and sharpened? Psychological studies point to the latter: we can increase our creative ability in leadership. In this crucial first step, we need to think inside the box before we think outside of it. The crew of the Apollo 13 mission serve as a good illustration of this. Their spaceship was slowly filling with carbon dioxide, and they had limited resources, a clear problem, and a (fatal!) deadline. In much the same way, we need to determine what the problem is, collect the facts, determine how much time we have, and assess what our resources are. Ask the right questions. Often we don’t implement good solutions because we haven’t accurately identified or articulated the problem. If we can’t clearly define what we’re facing, our proposed solutions will fall flat. Here, it is important to make sure we’re not exaggerating or minimizing the problems we’re facing. We might prioritize the problems in order of importance to make sure we’re not getting off track. How much time do we have to come up with a solution? Is there a deadline? Is it urgent? How serious is this issue? Are we missing information on the problem? Is it possible that we’re off track with the main issue? Research and reflection. Without research, we lack the necessary tools to fix the problem. We can’t synthesize a good solution if we don’t have all of the facts at our disposal. Try to synthesize what you’re learning through metaphors, symbols, or illustrations. Many of the great scientists were able to think in pictures, rather than language. Albert Einstein imagined himself moving at the speed of light, looking into a mirror. Since the light waves couldn’t reach the mirror in front of him, the mirror wouldn’t reflect his face. This is an odd image, but it helped him in developing his famous relativity theory. Isaac Newton saw a similarity between an apple and the moon when it came gravity. People had overlooked this connection, because one object was small and the other was massive. Yet creativity comes from seeing connections that have been overlooked. Have I spent time reading and researching the problem I’m confronting? Have I studied Christian and secular experts on the topic? This is the brainstorming portion of creativity. Don’t be too critical during this phase. Stephen Hall says, “Be optimistically objective.” Even if you don’t like an idea, just write it down and take note of it. Challenge the status quo. How do we know a given method is the right method? Have we made assumptions about a certain way of doing things without really challenging these assumptions with scrutiny? Might there be a better, unexplored alternative? Think big. When Bill Hybels faces a confusing challenge, he asks himself, “What would a great leader do in this situation?” This may sound simplistic, but it gets us thinking bigger and bolder. Study biographies about great leaders and how they overcame problems in their specific setting. Often, you don’t learn what to think in your situation, but you learn how to think about the problem. Silvano Arieti explains three parts to creativity: (1) initial analysis and a “dead end,” (2) walking away from the problem and resting and relaxing the mind, and (3) a spontaneous and unexpected solution. This doesn’t imply that we are being mentally lazy. Instead, it means that we need to oscillate between times of reflection and relaxation, allowing the mind to make free associations. When we’re tackling a major problem, it’s important to leave time to be alone to pray, meditate, or just daydream. Archimedes was taking a bath when he realized water displacement could show him the integrity of the gold in the king’s crown. He famously shouted, “Eureka!” (“I have found it!”), running down the streets of Syracuse naked. Thomas Edison would hold a brass ball in his hand and lay down on his recliner. When he drifted to sleep, the ball would fall and hit a metal tin underneath and wake him up. These little cat naps were just enough to allow his mind to relax, so that he could refresh his thinking. Albert Einstein would play violin or take long walks in the woods. He did this for a decade as a patent clerk in Switzerland before publishing his general theory of relativity. Researchers have found that spending time in nature boosts our creativity. Like taking a walk through an art gallery or listening to a beautiful piece of music, spending time in nature—God’s creative canvas—stimulates our creativity. Explore all of the possible solutions. Often, we can reuse an older solution to a new problem. Other times, we realize that our current methods aren’t working, and we need to explore new ideas. Do a pros and cons list. Write out the benefits and negatives of each proposed solution. Discern if you need INNOVATION or INVENTION. We need to employ creativity with our methods (invention) and creativity within our methods (innovation). Sometimes we need to make a good idea a great one (innovation). Other times, we need to start from scratch (invention). Do we need to push harder with our current methods, or change up our approach? Cynicism or discouragement. Am I personally discouraged about my work? Could God be sending me good ideas, but I’m too cynical or frustrated to see them? Ideas tend to ‘pop up’ at any moment, often catching the teacher by surprise. All too frequently, instructors may view this behavior as the student’s impertinence or criticism of their teaching methods. Actually, such a suggestion may merely reflect an individual’s ‘brainstorming’ an idea. Such brainstorming may be encouraged by permitting the individual (and the group that may be involved) to develop a plan for putting the idea to work. Don’t be threatened by someone sharing a contrary view. Instead, take this opportunity to explore it. Misuse or an over-emphasis on cooperative learning could contribute to degeneration of individual creation, imagination, and production; and that this could weaken intrinsic motivation, hinder the development of problem-solving and decisionmaking capabilities, and inhibit personal freedom to be creative. Before you go and ask or email several people for ideas, have you thought through the situation yourself? Have you done the hard work of researching the subject? Not being faithful with little. If you can’t employ creative leadership at a micro level, why would you push to have your ideas adopted at a macro level? Like anything else, we should be faithful with small matters before graduating to big ones (Lk. 16:10). Start utilizing creative thinking on smaller projects to show that your creativity is wise, valuable, and useful. Leaders’ meetings. Set aside time for collaboration with fellow leaders. Leave time with coleaders to explore problems together. These could be counseling issues, discipleship barriers, difficult conversations, etc. Are your leaders’ meetings times of creativity—or just negativity? Do you allow time to brainstorm and tackle problems with your coleaders? Are you averse to changing up your methods? How would you know? Are you excited when coleaders suggest new ideas, or are you threatened by it? Teaching. Do I ever take risks in my preaching by trying something different? Is it possible that my teachings are lackluster because they are predictable and routine? Am I a “one trick pony” as a teacher, or do I explore creative ways to preach and teach? Discipleship. Do I try different methods to motivate fellow believers in discipleship? Or do I try the same methods over and over without meaningful results? Prayer meeting. Is this meeting uninspiring? Is it just plain boring? Has attendance been spotty? Do I spend more time complaining about this meeting than I do thinking creatively about it? Solomon telling the mothers to “divide the child in two” (1 Kings 3:25). Jesus thinking quickly on his feet in public debate. Paul changing his approach in speaking to Greeks versus Jews. Agbor, Emmanuel. 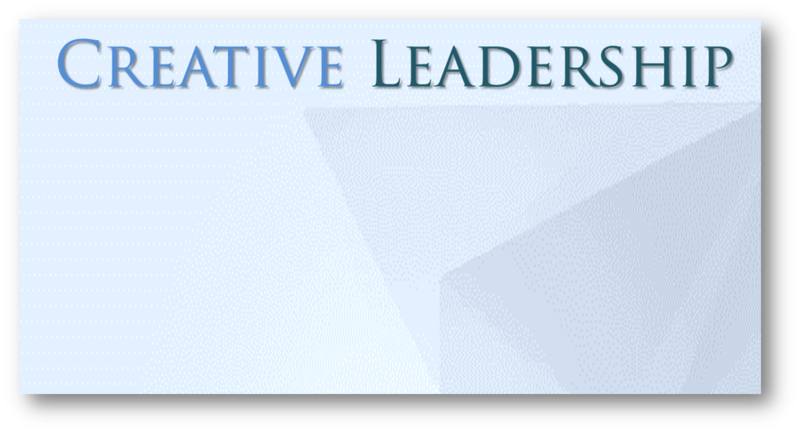 “Creativity and Innovation: The Leadership Dynamics.” Journal of Strategic Leadership, Vol. 1 Iss. 1, 2008, 41. Gomez, Jose. “What Do We Know About Creativity?” The Journal of Effective Teaching, Vol. 7, No. 1, 2007. Klemm, William R. “Leadership: Creativity and Innovation,” Concepts of Air Force Leadership. Mark A. Runco and Robert S. Albert, The Cambridge Handbook of Creativity (Cambridge: Cambridge University Press, 2010), 5. Peter Meusburger, Milieus of Creativity: An Interdisciplinary Approach to Spatiality of Creativity (Springer, 2009), 99. Jose Gomez, “What Do We Know About Creativity?” The Journal of Effective Teaching, Vol. 7, No. 1, 2007, 32. Balder Onarheim, “Three Tools to Become More Creative,” TEDx. Nick Skillicorn, “The Science of Improving Your Brain’s Creativity,” TEDx. Robert Sternberg, “Creativity,” Cognitive Psychology, 479. Gomez writes, “Convergent thinking is characterized by the reproduction of known concepts and the adoption of known responses to new situations. Divergent thinking, on the other hand, involves fluency, flexibility, and originality, and is essentially concerned with production of large numbers of new ideas.” Jose Gomez, “What Do We Know About Creativity?” The Journal of Effective Teaching, Vol. 7, No. 1, 2007, 33. Emphasis mine. Emmanuel Agbor, “Creativity and Innovation: The Leadership Dynamics.” Journal of Strategic Leadership, Vol. 1 Iss. 1, 2008, 41. I am indebted to Stephen Hall for this illustration. Stephen Hall, “The Secret Sauce of Creativity,” TEDx. William R. Klemm, “Leadership: Creativity and Innovation,” Concepts of Air Force Leadership. 453. Gomez states, “The evidence shows that the creative experience only comes after considerable effort and time has been put into the project.” Jose Gomez, “What Do We Know About Creativity?” The Journal of Effective Teaching, Vol. 7, No. 1, 2007, 33. William R. Klemm, “Leadership: Creativity and Innovation,” Concepts of Air Force Leadership. 452. Stephen Hall, “The Secret Sauce of Creativity,” TEDx. Silvano Arieti, Creativity: The Magic Synthesis (New York: Basic Books, 1976). Cited in William R. Klemm, “Leadership: Creativity and Innovation,” Concepts of Air Force Leadership. Jose Gomez, “What Do We Know About Creativity?” The Journal of Effective Teaching, Vol. 7, No. 1, 2007, 33, 36. William R. Klemm, “Leadership: Creativity and Innovation,” Concepts of Air Force Leadership. 455. The veracity of this famous story has been called into question. See David Biello, “Fact or Fiction? : Archimedes Coined the Term ‘Eureka!’ in the Bath,” Scientific American (Dec. 8, 2006). Thomas F. Collura, Technical Foundations of Neurofeedback (New York: Routledge, 2014), 134. Gregg Fraley “Creativity and Imagination,” TEDx. Brendan Lynch, “Researchers find time in wild boosts creativity, insight and problem solving.” The University of Kansas News Service. April 23, 2012. Jose Gomez, “What Do We Know About Creativity?” The Journal of Effective Teaching, Vol. 7, No. 1, 2007, 36. Emmanuel Agbor, “Creativity and Innovation: The Leadership Dynamics.” Journal of Strategic Leadership, Vol. 1 Iss. 1, 2008, 42. Emmanuel Agbor, “Creativity and Innovation: The Leadership Dynamics.” Journal of Strategic Leadership, Vol. 1 Iss. 1, 2008, 42, 43. Jose Gomez, “What Do We Know About Creativity?” The Journal of Effective Teaching, Vol. 7, No. 1, 2007, 40. Emmanuel Agbor, “Creativity and Innovation: The Leadership Dynamics.” Journal of Strategic Leadership, Vol. 1 Iss. 1, 2008, 41. Jose Gomez, “What Do We Know About Creativity?” The Journal of Effective Teaching, Vol. 7, No. 1, 2007, 35.